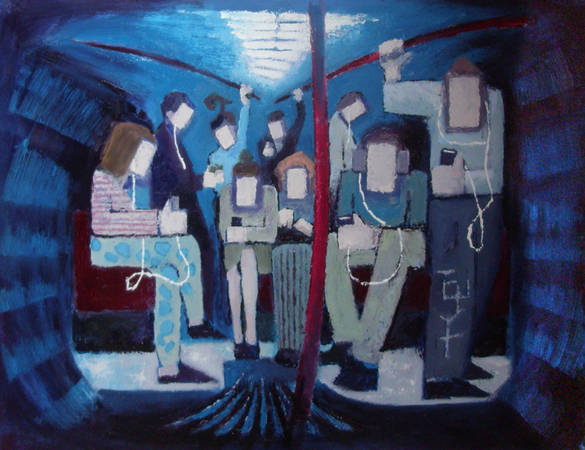 Underground 2013 is the title of this oil-on-canvas image from reader Tony Harrison. The overall impression is of a bleak, crowded, thoroughly modern Tube journey — commuters bow their heads, more in tune with their music players than each other. Despite the lugubrious mood and sombre palette, the unusual composition is artfully done, drawing the eye in any number of directions. We like this painting. A lot. We’ve now reached the closing date for our competition, and the winning entries — which will go on show in the Bishopsgate Institute — will be announced next week. However, we’ll keep the series running online, as we’ve received many excellent images yet to be published. Please feel free to send any further subterranean drawings, paintings or photos to matt@londonist.com. They don’t have to be Tube-related…rivers, caverns, bunkers…anything underground in London.